The drones are getting into final position to make the TIME cover animation. 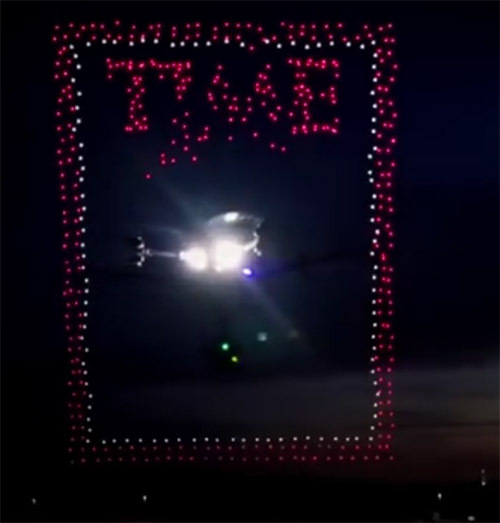 TIME Magazine’s latest cover was made by 958 Intel drones that were preprogrammed to create a sky animation of the TIME logo with red border. 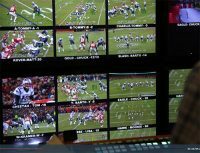 The Intel drones were also used to create a sky graphic during the Winter Olympics. For the TIME cover, the drones could not go above 400 feet. The drones were programmed to be 1.5 meters apart. Not only were the logo and border made by 1000 drones, but they also wanted to shoot it with an Astraeus Aerial drone using a cinema camera. One of the major challenges was not running into other drones considering how close they were. A little unexpected gust of wind could be disaster. An additional challenge was shooting at night. This gave them the contrast they needed for the LED lights on each drone to register against the dark sky. We first reported on using drones to make art back in 2015 in the article Make Night Art with a Quadcopter. A wide variety of drones are available at Amazon. As an advertisement to get me to read the magazine this “animation” did the job for me. And to make sure I was not disappointed, there’s an article in the same TIME issue explaining how drones have revolutionized how films and TV are made.